I’ve been doing a lot of reflecting on the continuity of our Spanish program at my school. We have a new 2nd grade – 8th grade teacher coming in this year, and I consider that a good opportunity to take a fresh look at how the three of us Spanish teachers are working together to streamline our program. I’m tired of students who have taken years of elementary and middle school Spanish entering high school to re-learn colors and numbers. I’m tired of students telling me they’re not learning anything, they’ve never learned anything (which they have done for the past five years regardless of teacher – I mean, for six different teachers they’ve whined about this). So, I thought that finding out what they were thinking was a good place to start. I polled three grades – 8th grade, 10th grade, and 11th grade. I’ve just finished a cursory analysis of the data I got from 8th grade. Basically, I wanted to know whether they were looking forward to Spanish 1, and what they thought they could do in Spanish, and how the two questions related to each other. 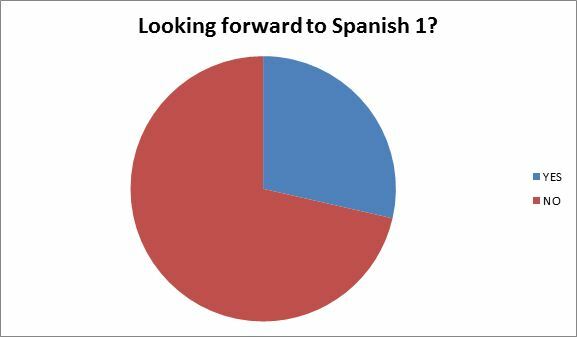 If students were looking forward to Spanish, was their motivation primarily intrinsic or extrinsic? If they weren’t, what had killed their motivation? Would students who didn’t like Spanish think they were capable of less? My first question was basic: are you looking forward to Spanish 1? We asked 42 8th graders, and the response was not encouraging. That’s 12 yes and 30 no. 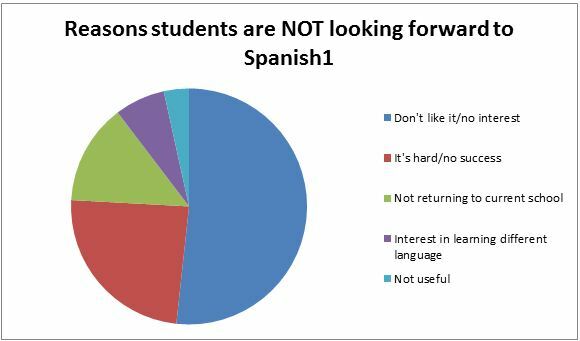 (Note: for some of the responses of students NOT looking forward to Spanish 1, they did not answer the question the way it was asked, so I could not analyze that and the sample size for the reasons is not 30.) Pretty straightforward result – more than 70% of our 8th graders are not looking forward to taking Spanish 1. This result really surprised me. The top two responses across the board were 1) the school requires it and 2) to get a better job/the job I want. 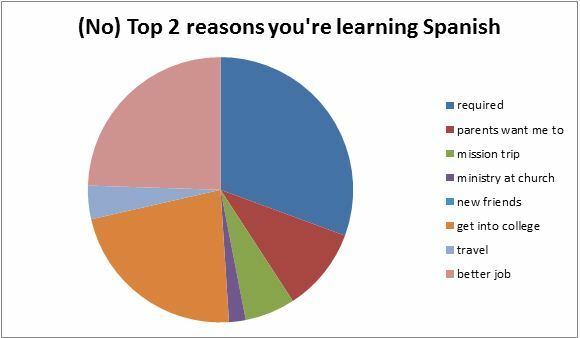 I thought that students looking forward to Spanish 1 would be more intrinsically motivated, but the difference in percentage is not that significant. There are a few differences, however. Note that among the students with a positive attitude, more are motivated to make new friends or travel in service projects (many of our students go on missions trips around the world with their church groups), and fewer were motivated by college entrance requirements. It’s also interesting that none of the students looking forward to Spanish 1 indicated parent pressure to learn the language. For the students NOT looking forward to Spanish 1, I wanted to dig a little deeper. What was the reason behind their negative attitude? I got a variety of answers but they fit neatly into particular categories. The survey was anonymous and I told students to be honest, so we did get a couple of very negative answers (I won’t use it in life, I speak English ONLY), but I was surprised at how few those were. More than half the students gave an answer along the lines that they just didn’t like Spanish or weren’t interested in it. Another significant number answered that they found it too hard or didn’t do well at it. So what can we take away from that? Dig deeper into what motivates your students. Tailor your curriculum to your students’ goals to access their motivation. Know your students and what interests them. Realize that if you insist on boring your students in the name of “getting in the material,” you are creating a class where students are filling a seat because they have to, and will leave as soon as they can. Create opportunities for success. I can’t stress that enough. Success is motivating! Have you ever surveyed your students? How do they feel about your class? What motivates them? 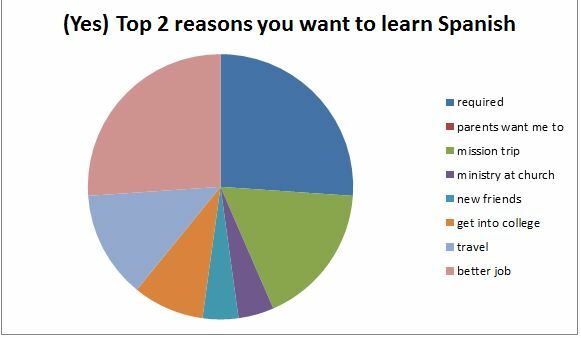 This is very interesting to me, not really because the results surprised me (mostly what I expected) but because I conducted a little research myself on how requiring Spanish (without other options, minimum of 2 years) affected motivation. Your findings here are almost the missing piece to my findings, because it LOOKED like offering more languages would be fruitful. However, with your results, it does NOT look like a good investment for a small school!